Want to know more about our church, such as what we believe, how we seek to worship and serve the Lord, and more? 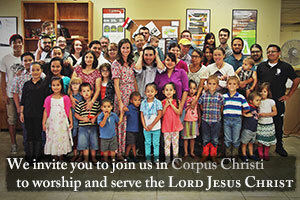 Are you looking for a reformed church in Corpus Christi? Find out more information below; feel free to call or e-mail us too! We believe that in any church, whether it is a reformed church in Corpus Christi or a baptist, presbyterian, evangelical, methodist, etc... the most important thing is to answer 'How can a person be right with God?' If a church is wrong in that one point, it doesn't matter how 'right' they might seem in every other area of ministry. We believe the Gospel of Jesus Christ is the greatest need of our generation, and seek to study, preach and spread this Gospel of salvation for sinners to all who will listen! You can learn more about the Gospel on our page here. We take the belief and study of Biblical doctrine seriously, as what a person believes influences the whole of their life and their eternity. We endeavor to believe and preach a Biblical, Christ-centered reformed theology rooted in the Scriptures as the final authority over all religious traditions and creeds. We believe God’s Word is sufficient for the needs of God’s people and remains inerrant and inspired from its original manuscripts faithfully translated down through the centuries. We strive to systematically study the Word of God and emphasize expository preaching with Jesus Christ as the center and grand theme. We aim to work verse-by-verse through different books of the Bible as our main method of teaching. However, there are occasions that also require topical approaches to certain subjects as well. Anyone interested in our teachings is encouraged to listen to some of the sermons on the sermons resource page and hear for themselves. 12:30pm Fellowship Meal – Visitors Welcome! We also open the doors on Sunday morning at 9am for prayer before the main service begins, visitors are welcome to join! Our Sunday morning services are a mix of traditional hymns and contemporary songs we feel are as Biblical and worshipful as the older hymns. We practice congregational singing and also leave the time open to song requests by those in the congregation. Songs are generally accompanied by either guitar or piano, or sung acapella at times without accompaniment. We do not have a worship band or worship leader, and seek to diminish the attention on the performance of anyone assisting the congregation with worshipful singing through musical instruments, so as to keep attention focused on the Lord in our worship. We do not practice age segregation within our fellowship and encourage all families to bring their children, regardless of age, to the meetings throughout the week. We are not a formal member of any FIC groups, but do agree in principle with the aspects of the movement as they pertain to Biblical involvement of families within the meetings of the Church and the family’s role in instructing their children in the Scriptures. While this is a practice that stands in contrast to the main stream of Evangelicalism in America today, we trust that Biblically, and historically, the practice of the Churches of God throughout the world has been to involve and include children within the meetings of the Church. This small space does not suffice for an apology or defense of this practice to the common objections of our day; if you have question please do contact us via e-mail or phone. As would be expected from the above statements, we do not have a youth group or Sunday school specific for various ages, and do not plan to implement this in the future within the main Church meeting times. We also do not have a staffed nursery, but all effort is made to provide parents with a cry room or other place to attend to their children in private as needed. We encourage everyone to give as God has given them a desire and burden to do so. God loves a cheerful giver, not one who is guilted or influenced to give by others, and thus we aim to leave personal giving to the ministry and the church as much between the individual and the Lord as we can. There is no offering time during any of our weekly services, nor will there be appeals for money. There is a small white box on the back wall of the church building where people are free to leave any offering to the Lord they desire. We believe that the Scriptures make clear our obligation and privilege as Christians to go out to a lost and dying generation to proclaim the riches of the Gospel of Christ to them! The Bible makes clear that sinners will not be saved unless they hear the Gospel. Romans 10:14 “How then will they call on Him in whom they have not believed? How will they believe in Him whom they have not heard? And how will they hear without a preacher?” We greatly desire to participate in the harvest of souls in our generation and in our city. To find out more about our evangelistic outreaches you can call us or visit, or see our evangelistic website as well. Sovereign Grace Community Church was started through the Lord’s providence in August of 2008 by the men and women of Grace Community Church of San Antonio, Texas. The original fellowship formed with several families of similar doctrinal persuasions seeking an evangelistic, reformed church in Corpus Christi, TX based upon the Word of God, with a passion for Christ, and teaching the full counsel of the Scriptures. The intent of the leadership in San Antonio and the Christians in Corpus Christi was, from the start, to plant the church in one of the needier parts of the city and seek to serve the poor. The church has since grown as an evangelistic inner-city ministry with a desire for the true, Biblical and historical Gospel of Jesus Christ to be proclaimed throughout Corpus Christi, the Coastal Bend and the world. The church became independent from GCC in July of 2010 and was no longer considered an extension ministry of GCC but an independent congregation of like-minded believers. Following a year of testing various men and examining them for the potential to serve as elders over the church, SGCC in conjunction with the leadership at GCC and Lake Road Chapel ordained the first two pastor/elders in October of 2011. Website Design Services Provided As A Courtesy By Inbound Horizons Inc.